Joseph Galloway a prominent Loyalist during the American Revolution was born in West River, Maryland in1729 and died August 29, 1803 in Watford Herts, England. After a course of preliminary study, during which he seemed to have acquired a taste for religious speculating, which remained withhim through life, he studied law and began to practice in Philadelphia where he acquired distinction in his profession. He wan an intimate friend of Benjamin Franklin, and when the latter went to England, in 1764, he placed in Galloway's hands his valuable letter-books and other papers for safe keeping. He was chosen to the assembly of Pennsylvania in 1757, and almost continuously thereafter until the Revolution. He was its speaker from 1766 until 1774, being elected by unanimous vote. 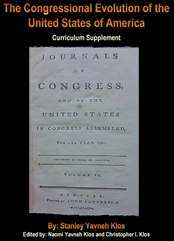 In 1769 Princeton gave him the degree of LL.D. In his capacity of member of the state legislature, he made a speech in opposition to John Dickinson and in favor of changing the government from the proprietary to the royal form. In the early part of the colonial struggle he exhibited sympathy for the crown, andgrew to be an active Tory. Through his influence as speaker of the assembly he had himself chosen, with his friend, Chief Justice Allen, to the Provincial congress, with the purpose of influencing that body in favor of the king. As a member of the congress in 1774, he proposed a scheme of government to consist of a president-general, to be appointed by the king, and to hold office during his pleasure, and a grand council, to be chosen once in three years by the assemblies of the various colonies. In December of the same year he was chosen to the congressto meet the next May, and soon thereafter published "A Candid Examination of the Mutual Claims of Great Britain and the Colonies: with a Plan of Accommodation on Constitutional Principles." After serving in the Congress of 1775, he retired to his country-seat, where Dr. Franklin visited him, and unavailingly sought to win his support for Colonial rule. Galloway was a prominent Loyalist. He was speaker of the Pennsylvania Assembly from 1766 to 1775. As a delegate to the First Continental Congress, he tried to avert the imminent break with Great Britain. He proposed a scheme for self-government to the colonies while maintaining allegiance to the mother country, suggesting that all legislation affecting the colonies be approved both by parliament and by a council representing the American states. The plan was rejected and when war came Galloway sided with the British. He went to England in 1778. Manuscript Document Signed "Joseph Galloway." "Message to the Governor from the Assembly" by Galloway as Speaker of the Pennsylvania Assembly, relaying the pleasure of the Assembly to John Penn concerning a recent treaty with the Indians establishing a boundary line. The Assembly further pledges to do everything in its power to keep relations with the Indians at a peaceful and prosperous level. 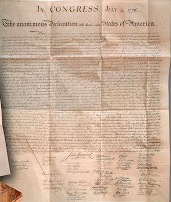 This document is an important statement of Pennsylvania's intent to keep peaceful relations with the Indians. We invite you to read atranscription of the complete text of the Declaration as presented by the National Archives. The article "The Declaration ofIndependence: A History , " which provides a detailed account of the Declaration, from its drafting through its preservation today at the National Archives. Start your search on Joseph Galloway.